We continue to watch the cash payments of Bonita Springs home sales hover in the fifty percentile. 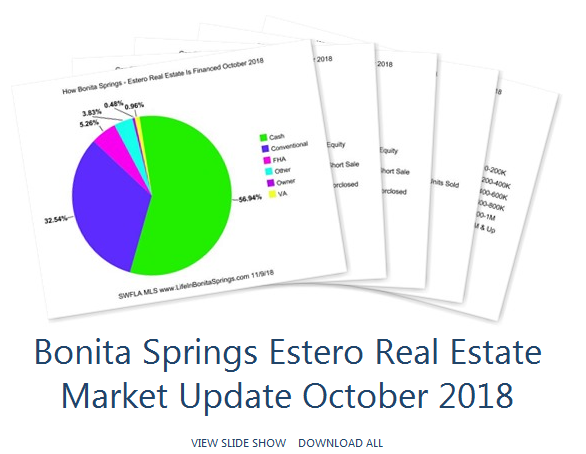 As the prices of Bonita Springs real estate rises, the liquidity of home buyers tightens up so we don’t look anticipate an increase of cash buyers in the near future. The sales volume, the units sold is somewhat steady. The real estate buyers have returned for the season and the low inventory of rentals available fuels a bit of a buyer boom going into “season”. We simply have fewer rentals to go around. Our distressed sales are almost non-existent. There are a few foreclosures and a few short sales but they are actually uncommon. Those who are looking for a “deal” should consider purchasing a home in a neighborhood with heavy inventory and renovate/update the home. Some great places to search for homes would be on the “original side” of Village Walk of Bonita Springs, Spanish Wells and The Reserve at Estero. These Bonita Springs and Estero neighborhoods have inventory and the value priced homes may need updated when compared to recent design standards and new construction in other nearby areas. The most significant volume of sales continues to be the $400,000 and under price point. It’s symply due to affordability especially for the snow bird buyers trying to get a winter residence for 2019. If you’d like more information about the current real estate market and negotiating in communities with favorable conditions for real estate buyers contact Chris at 239-273-7430.